Lake Natron is soda lake nestled in Natron game controlled area known for lesser flamingoes, ol doinyo lengai and wildlife. 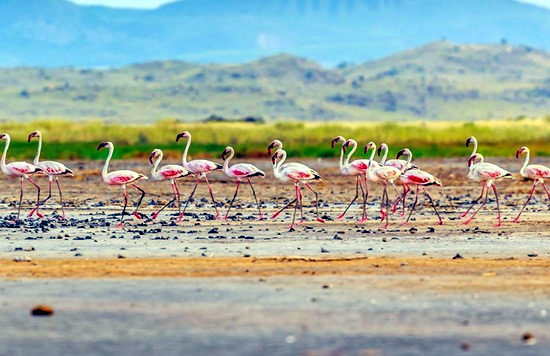 Lake natron is famous for pink flamingoes and other acquatic birds species while other attractions include Engaresero river waterfalls, Oldonyo Lengai Mountain, Gelai mountain and wildlife species. Lake natron nestled at 600m above sea level and received water from rivers and spring of Engaresero and Ewaso Ngiro. 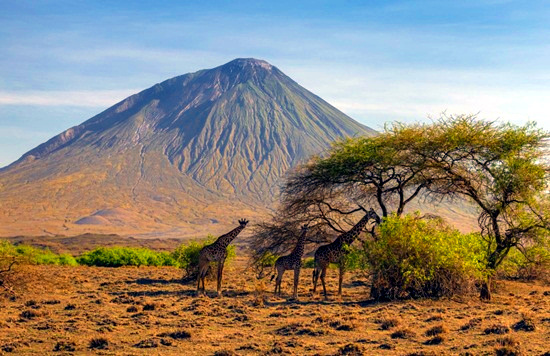 Natron area is typical dry land covered with acacia trees, rock hills, rivers, volcanic peaks of Gelai and Oldoinyo Lengai and wildlife species include giraffes, zebra and antelopes. Natron is a breeding site of lesser flamingoes in Tanzania and the lake area covered bycaustic barrier that hinder predators to reach flamingoes nests hence is a paradise for birdwatching especially flamingoes. Lake Natron is purely adventure destination inhabited with Maasai community with various activities as hunting safari, motorbike adventure, lengai volcano trekking, bird watching, historical tour, swimming and cultural expedition.